Sourcegraph has extended its code intelligence to include Java! Let's take a high-level look at what this means for devs and how you can put it to work. Every feature mentioned in this post is available now for Java on Sourcegraph.com and Sourcegraph Enterprise. Scroll down for the detailed feature list. Seamless, zero-config code exploration in your web browser. An easy-to-use HUD for code understanding. Sourcegraph works within seconds on any revision of code and scales to large repositories. It even works for newly pushed revisions such as those submitted for code review. 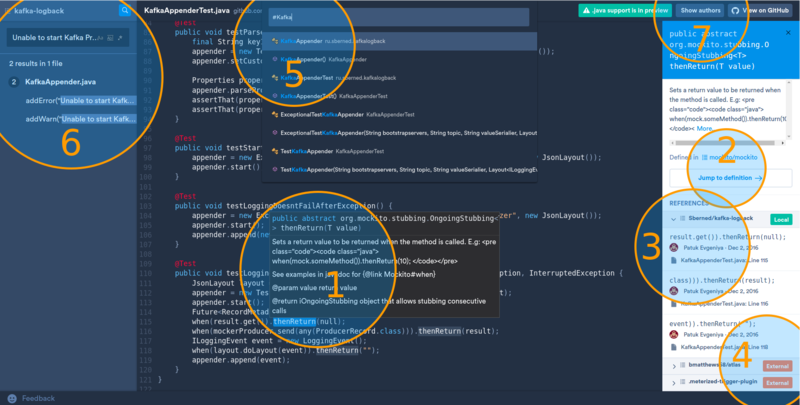 Sourcegraph integrates with code review tools like GitHub pull requests. If your favorite code review tool is not yet supported, please let us know! Because Sourcegraph is just a web app, you can link to any location in your codebase. Our users have found this useful as a starting point for code discussions. Sharing a link is easy and doesn’t require the person on the other end to go through the annoying exercise of opening up a new editor or stashing their work-in-progress changes to check out your branch. Using Sourcegraph, I was easily able to identify the author of a piece of code and start a conversation in chat by linking him directly to the code in question. Sourcegraph’s jump-to-definition works even if the definition is in a separate repository or an open-source library. Because it’s all on the web, there’s no need to check out code to your local machine. We offer support for additional build systems to enterprise customers. Please email hi@sourcegraph.com for more info. Programmer’s note: We support the common case for the build systems above, but now and then we encounter a corner case that isn’t yet supported. If you try out Sourcegraph on your repository and find jump-to-definition or hover tooltips do not work, please let us know via the “Feedback” button at the bottom of the screen. We are incredibly responsive. Or you can test it out on your private repositories on GitHub.com. Is There Value in Having Non-Technical People Do Code Review? When You Need an Explanation?